First impressions are critical. Studies reveal it takes less than .2 seconds for a person to form a first opinion online, and it only another 2.6 seconds for the viewer to reinforce that first impression. If your personal or corporate brand misses the mark, that new gig, sale or hot date might never materialize. The simplest way to get a sense of your ‘virtual self’ is to type your name into Google. As only 10% of people go beyond page one, that first page is the one that counts. Are you there? Anything negative? Either way, you want to own or at least control your story. By being proactive, you’ll add value to your brand, contribute longevity and visibility to your reputation, and protect your identity from being appropriated and misused. George stated people should mind everything they post online, including photos. “You wouldn’t want a future employer or date finding an unflattering personal image of you,” she said. Remember that time? Well, best to keep it ‘on the low’. Google your name and be sure to do an image search as well. You’ll quickly determine if your friends tagged you in a compromising situation. Set up a Google Alert on your name and/or business to keep on top of fresh content. You can request daily or weekly updates. For $10-$15 a year, securing yourname.com makes sense. You’re setting up a safeguard, and you can arm it with articles, interests, a bio and even your CV. Don’t have 23 spare hours a day to post on Facebook, LinkedIn, Twitter, Google+, Tumblr, Pinterest and YouTube? No problem. You can at least lock them up. And if you get ambitious, you can occasionally post on platforms that make sense to you. Blogging is also an effective way to appear on search engine results. Old-school PR still works. If you have opportunities to share an opinion and gain profile on third-party sites, make yourself available. When publishers reach out, I’m quick to open up my calendar. Here are two recent interviews I did, one on creativity and another on the relationship between content and design. Both have spawned valuable relationships and leads. Don’t argue online, and be quick to put your ego aside and apologize. Even if you’re technically correct, you don’t want to come across as petty or unprofessional. We’re all vulnerable to online reputation attacks. These few simple steps can help make — and keep — your reputation squeaky clean. Make a good first impression with your website. 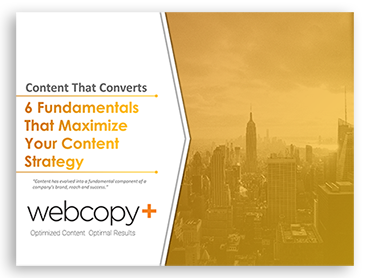 Say goodbye to dummy text and hello to smart content.